In most formal dresses I make there is a need for boning. Boning had a bad name from when it was over and poorly used in the classic off the shoulder 80’s bridesmaid dress. Here are the types of boning available as well as information on what they do and how I like to use them. 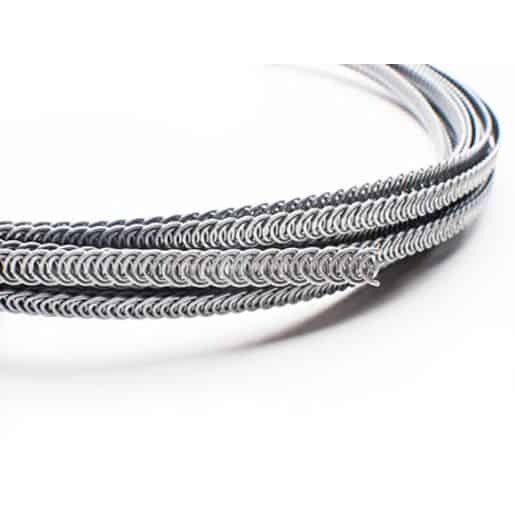 Woven plastic – This boning is made of strands of plastic wire woven together into a strip. It is the softest boning available and a wonderful way to keep lines smooth over the body and keep strapless tops from falling down. It is easy to use as you can sew straight through it between the plastic. plastic – Spotlight/lincraft quality. This quality is great for a wear once only dress. It may have some issues but actually can be removed from its tubes and a fresh piece inserted if you want to wear the dress again. Plastic – specialist online supplier quality. This boning is made of better quality plastic and also comes in more widths than the basic quality mentioned. The wider boning is useful for areas where more strength is needed. When boning is used for cinching in a waist it needs to be good quality. The closure also needs to be considered. A tighter dress will be impossible to close with buttons. If you dont want lacing in the back of the dress I would make a lacing closure inside, this can be pulled tight to fit the dress and then buttons or a zip closes the outer layer over the top. One bride I did this for I could foresee some trouble untying after the wedding champagne so made sure they had some scissors and used a satin ribbon that could be easily cut and replaced. 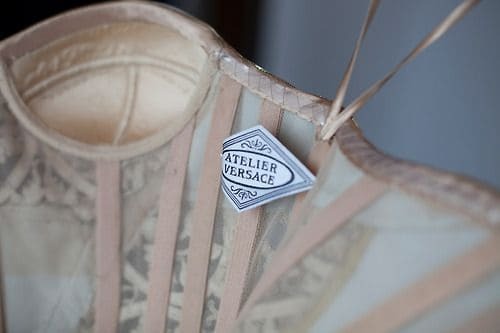 Inside a Valentino dress showing boning in the bodice. This dress also has a tape at the waist and under the bust. Spiral steel – This boning is usually used for corset making. 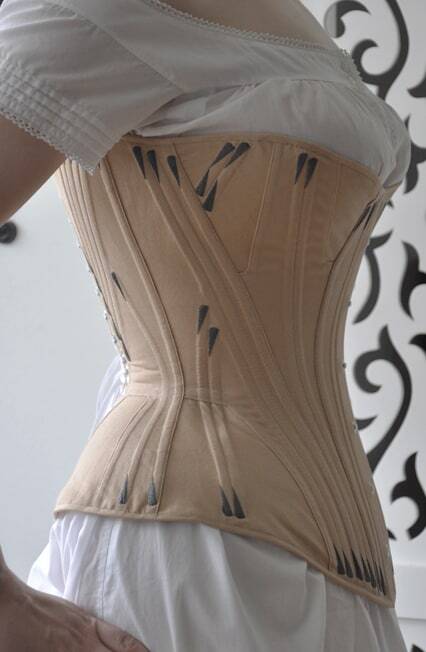 Before using corset boning in a dress I would increase the amount of plastic boning and refine its position. If that wanst going to cut it then spiral steel is the next step. It is made from what looks like a spring of steel that has been flattened and is flexible both front to back and side to side. The curly endes are trimmed and capped with a little clip or rubber dipped so there is a nice smooth top. Solid Steel – I must admit i haven’t used this type of boning myself although I am working on a pattern that will use them so I can test how they work. This kind of boning is only Flexible only front to back. 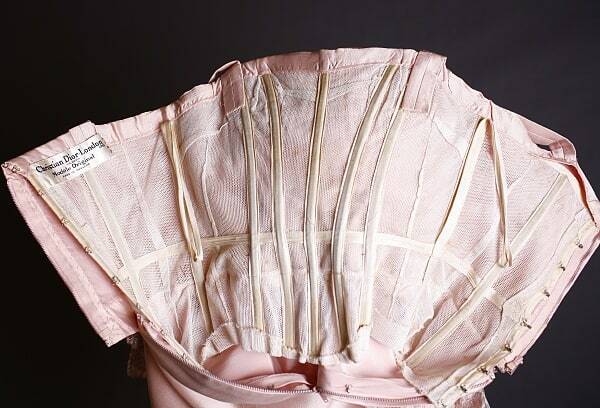 A boned corset in all its complicated and flossed glory. The bad reputation of boning I think comes from poor placement, Bones that are too long will dig in under arms and into hips. Types where the stitching isn’t through the boning need to be secured in place so they dont move up and down inside their channel (this lovely hand stitching seen in corsetry is called flossing and is an art form as well as a technical necessity) Boning quality also matters, if it is a bit weak it will ‘crack’ at the waist when it is bent, This will mean a crease will form in the bone that doesn’t dissapear so will stay pushing into you Craching can also be avoided by using a bone on an angle around curvy areas instead of straight up and down them. This entry was posted in Blog, construction, History of fashion, Ideas for brides and tagged boned.